As I previously wrote about (Ecto-Containment Blog Post) I wasn’t a fan of Extreme Ghostbusters. Which even in recent years around the only season of the animated series seemed strange (in my neighborhood or yours) that I wouldn’t be a fan of something Ghostbusters. It couldn’t mean I wouldn’t have an interest in its toy line eventually. Trendmasters, a company who once shelled out the big bucks for Godzilla ponied up to bring us new Ghostbusters toys. With only one season of Extreme Ghostbusters, its associated toys were headed to Clearance City. 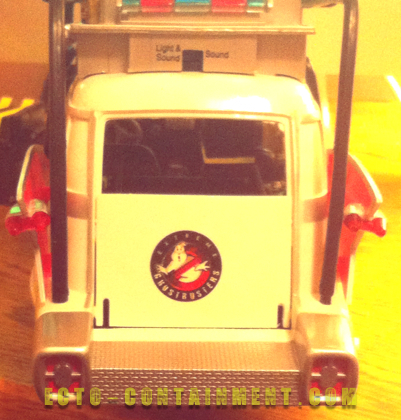 It was probably about that time I started collecting Ghostbusters and some The Real Ghostbusters merchandise again. It wasn’t the right time for me to collect any Extreme Ghostbusters toys. In Fall 2000 during a probably mundane trip to our nearest Big K-Mart I went downstairs and was checking out the toy section. 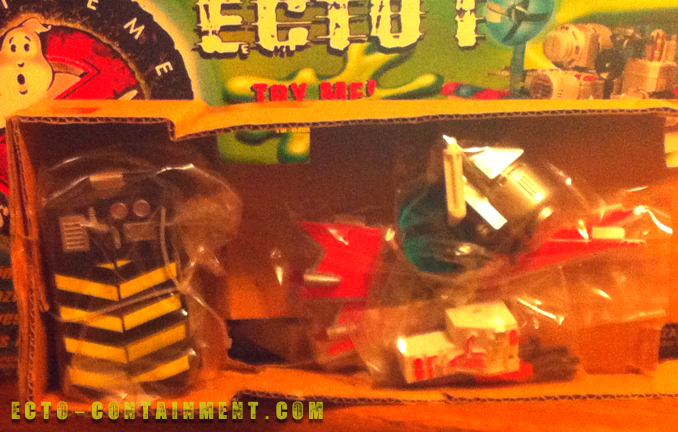 Almost like finding buried treasure, either all or most of Trendmasters Extreme Ghostbusters toys were still available. 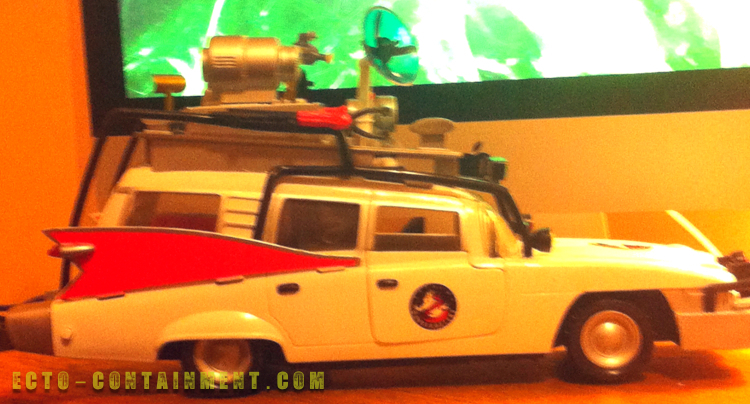 If I hadn’t spent nearly a year saving for my Proton Pack replica I might have bought the Extreme ECTO-1. 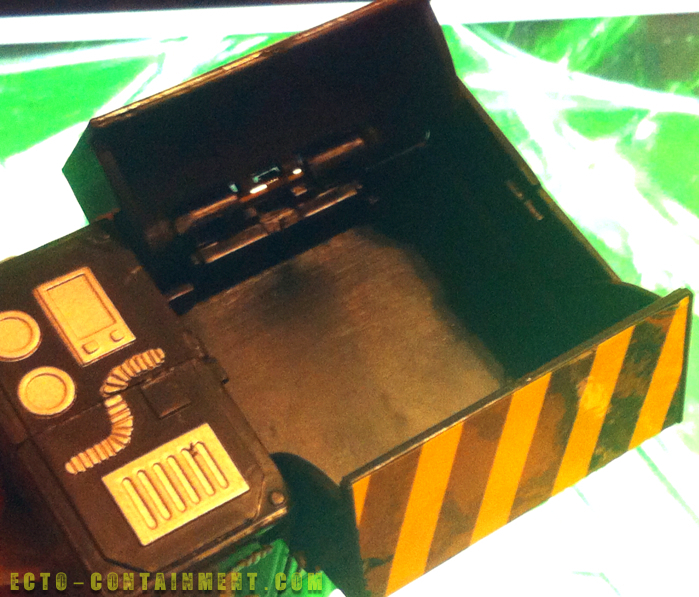 In 2011 while searching eBay I came across an auction for a SMIB Extreme Ghostbusters ECTO-1. I have no idea the rarity of this Ghostbusters toy. I remembered how I could have easily bought this for clearance more then once all those years ago. 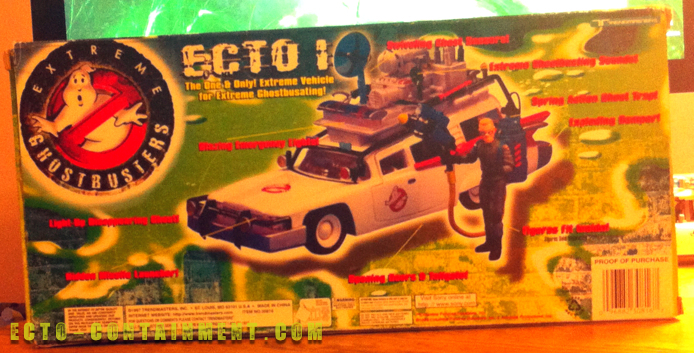 Even without being a fan of an extreme Ghostbusters series, its ECTO-1. I didn’t let it pass me by again. Once I had it, I checked out the box and put in storage. I didn’t and don’t have furniture to display much of anything I’ve collected. Pretty much except for seeing it, I wouldn’t do anything else with Extreme ECTO-1 until May 2015. 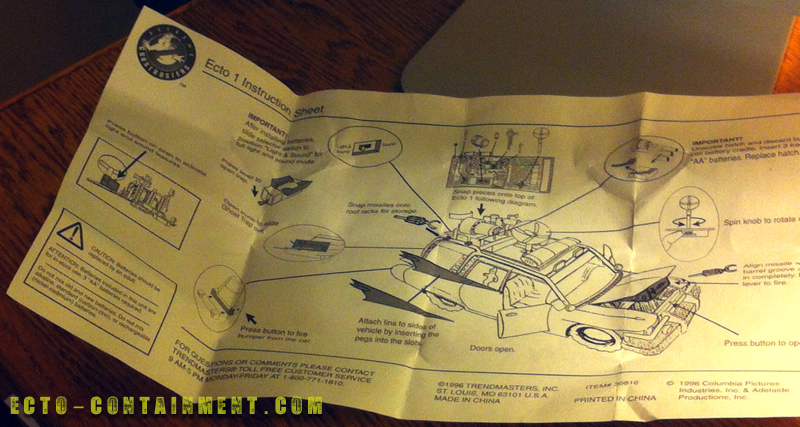 The timing was finally right to unbox (well their goes that investment) this ECTO-1, thoroughly check it out, and write a review. 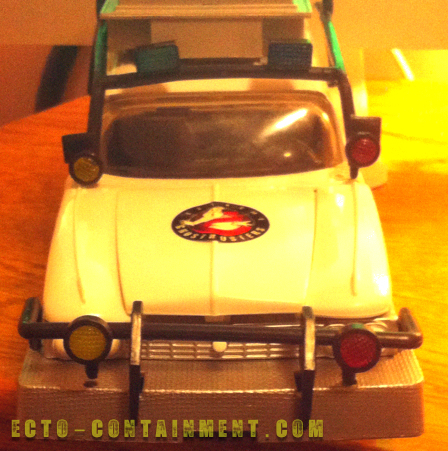 This ECTO-1 unlike its Kenner predecessor Extreme Ecto-1 has lights and sounds. Their is a try me area to entice kids to want this toy that much more! I remember the one I could have bought in 2000 working. When I received mine from an eBay seller, it worked. About 4 years later nothing. The graphics make it seem that Extreme ECTO-1 lights up like a real vehicle of this nature. i.e. : headlights, emergency lighting. I doubted the claims. No toy battery is that good plus toy companies have been exaggerating what their toys can do at least since my childhood. A ghost that lights up and then disappears! Before kids and collectors can use their Extreme Ghostbustin mobile “some assembly required.” Maybe Kenner had the right idea a decade earlier. Maybe its because I’m older or my unfamiliarity with the extreme cartoon version it took me an evening to build this car up. Despite my best effort the passenger side fin isn’t as secure as the drivers side. And I broke the ‘protruding’ roof video camera peg. From Ghostbusters, The Real Ghostbusters, and not knowing every feature of the animated Extreme ECTO-1 I don’t like how this version has this removable platform roof to support the ‘weight’ of the ‘equipment.’ A pain when you aren’t 7. Which I guess fits some of the Extreme Ghostbusters figures. Plus the delicate accessories can easily come loose. 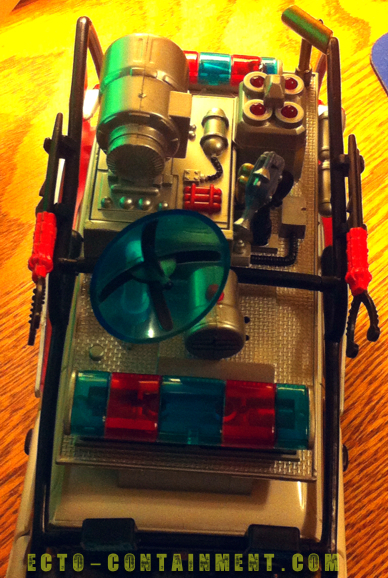 Some of the known ECTO roof features seemed force to fit the toy version. i.e. : tanks. Maybe those look much better on the animated version. Although they don’t light up, the bumper guard headlights use a type of plastic that gives them a realistic textured feel. They could be reflective though. I didn’t even try to test it. Instead of a engine graphic and a transmission that can fire missiles (why?) 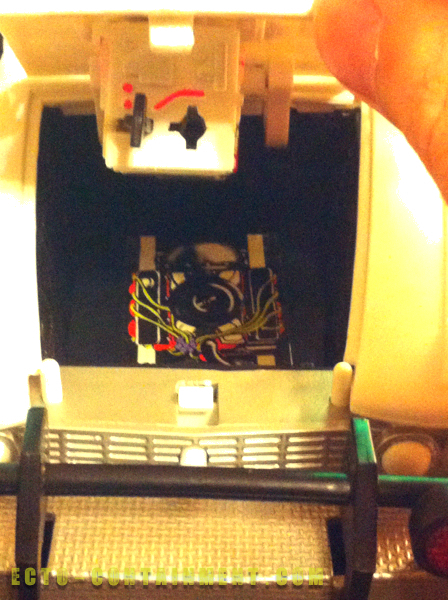 from the engine bay, Trendmasters could have just made an engine accessory that did the same thing. I may have “installed” the transmission sideways. It seemed right. The missile launcher worked as intended. As it may make inanimate toy figures nervous to drive around with a loaded missile, the two missiles which resemble a cross between a drive shaft (some mechanic is laughing) and seafood pinchers can be stored on Extreme Ecto-1’s safety cage. Near other sensitive and perhaps technical ghostbustin equipment. I like the way the doors open with a sliding action that I presume allows the figures to sit in the vehicle. 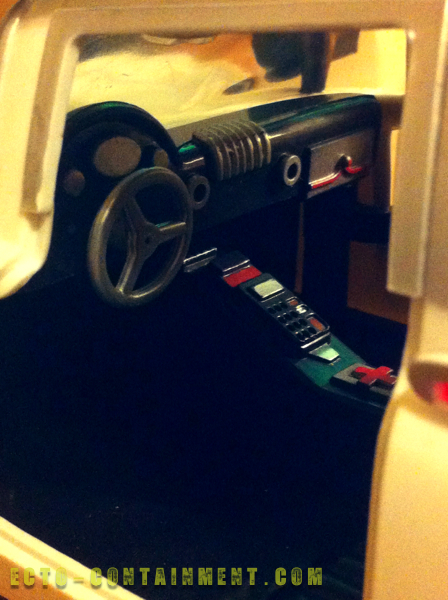 Some of the detailing is well done, such as the dash/control areas. I had wondered why this ECTO-1 didn’t have a rear window. Made more sense once I saw that the extreme action could occur with the door open, revealing a way to slide in, no not proton packs. One. Oversized. Ghost Trap. A rear window would only get in the way of catching multiple ghosts throughout a call. 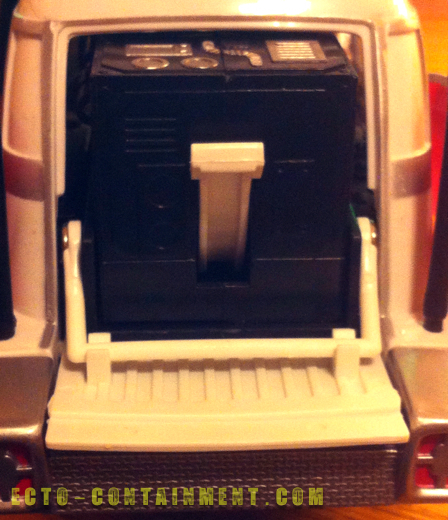 With the rear door open, the ‘rack’ easily allows the trap to fit securely. One just lifts the trap a little to slide out. Pulling the lever opens the large trap doors. It probably doesn’t matter to a kid, (at least not in 1997) their doesn’t seem to be any way to control the volume of the sound. It is loud, it is…EXTREME! If it was thought of, Trendmasters didn’t include a lights only setting. Pressing a single plastic red button more then once can provide the soundtrack to your next migraine. The cycling of the sounds provides sirens, getting calls, and firing of proton streams. Having lighting is momentarily cool. Not sure if its the age of this ECTO-1, its suppose to be that way, or its how it was stored somewhere since it was made, one side of a light bar isn’t working. I made a 3 minute + video to show off the lights and sounds. Even the video is loud. My computer volume was and hardly is up to maximum. I may upload it eventually, I would need disclaimers. While I prevent a future headache for you, an unboxing page has been added.